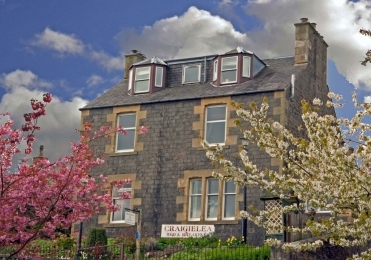 Family owned Craigielea is a late Victorian townhouse in the Scottish Borders town of Galashiels. Within easy walking distance of restaurants, pubs and shops, we offer an ideal centre from which to tour the lovely Borders region. Click on the link below to view photos of the Borders region on our Instagram page. The Borders area has some of Scotland's finest fishing,picturesque and challenging golf courses, and the world class MTB trails at Glentress and Innerleithen. We have some fantastic walking, whether a short stroll along the banks of the Tweed, or a marathon 12 day hike along the Southern Upland Way, and everything in between. If you’re looking for a more relaxing stay, the border towns have many excellent restaurants, small individual shops, including some very fine mill shops selling tweed and cashmere, and a myriad of castles and stately homes in which to while away an afternoon. So come and stay a while, and enjoy everything that this beautiful area has to offer.